The PiCUS Tree Motion Sensor is a small electronic instrument that records dynamic structural root zone movement (called tilt) to accurately measure the tree’s response to wind. By accurately measuring the tilt movement of a tree’s structural root zone in high wind the stability of the tree can be assessed. One may ask “Why use dynamic over static loading?” The answer is simple - nature is more powerful and more unpredictable. Winds are dynamic and come in gusts from any direction. Wind direction is important when assessing tree stability because wind comes from many directions and often the most destructive wind comes from an unexpected direction. Data from tilt sensor monitoring is especially valuable in urban areas where nearby buildings and other structures can affect wind direction and cause unexpected tree failures. This method uses dynamics to assess the stability of a tree, which is different to static methods. Because an overturning moment is a dynamic event it is important that dynamic methods are used to measure how the tree responds to wind. The static pulling method does not accurately recreate the dynamic forces on trees and structural root systems under natural wind loading. The structural roots are the foundation of a tree’s stability, providing soil anchorage for the tree. Stable trees that are securely anchored in the ground will tilt slightly when exposed to high wind. Even in high wind, stable trees record only a low range of tilt movement. Excessive structural root zone movement indicates a reduction in stability and that the tree may be prone to an overturning moment. 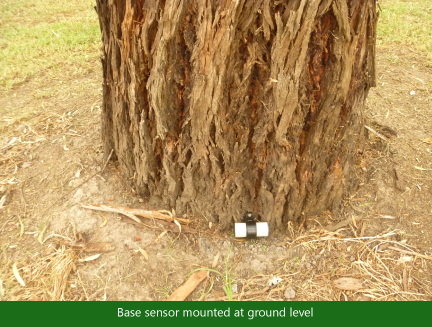 By using the PiCUS Tree Motion Sensor and treesensor.com the stability of tree structural root zones can be accurately assessed. The PiCUS Tree Motion Sensors are small, portable and non-invasive. The sensors are easily secured to the tree using two screws. This system can be used to monitor a single tree or groups of trees. It is suitable for use in both the urban and forest environments. 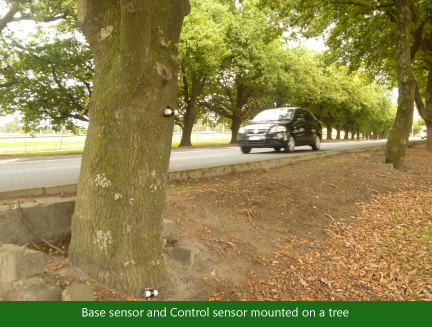 When installing sensors it is recommended that two sensors are placed on the tree: one at ground level (Base) and a second sensor (Control) is placed higher up the trunk above 2.5 metres. Data from the Control sensor records trunk movement and is used to confirm if a wind event has occurred. The Base sensor records the tilt values at ground level and provides the critical data used to establish the stability of the tree. Groups of trees can also be monitored by attaching one PiCUS Tree Motion Sensor to each tree located on the site. This has the advantage of comparing the tilt movement of several trees that are exposed to the same wind and environmental conditions. Stable trees will record low tilt movement values and any trees that are moving excessively can be identified. It is recommended to always place a Control sensor on one of the outer perimeter trees in the group. The PiCUS Tree Motion Sensor can continuously monitor tree stability for at least 20 days. The sensor is easily removed from the tree and connected to a computer via a microUSB connection. Alternatively, if further monitoring is required, the sensor can remain on the tree while the SIM card is removed so that data can be uploaded for analysis and compiled into a report. This ensures consistency between subsequent datasets. At the completion of a monitoring period please refer to the ‘How To Create A Report’ page of this site for directions on producing your tree stability report.